Well, the big day is almost here and GSA Archives and Collections are winding down for a well earned rest! 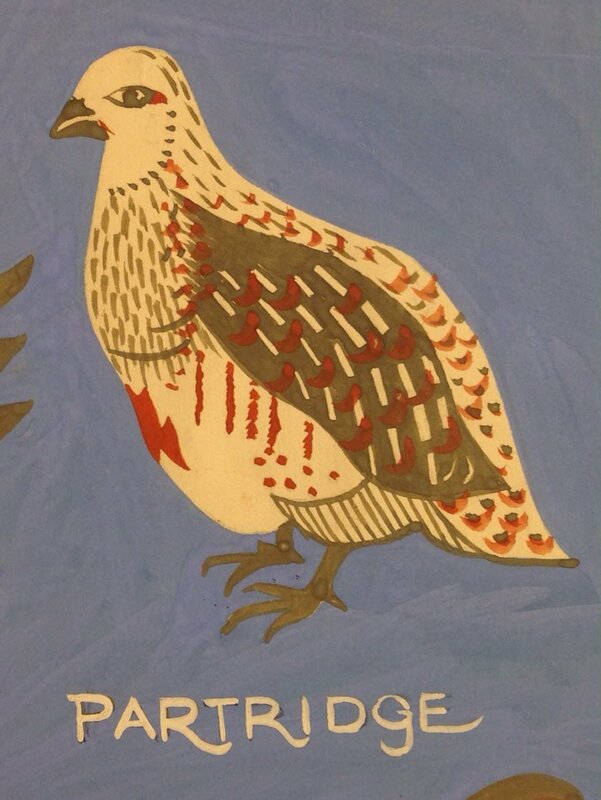 On the 1st day of Christmas GSA Archives share with you … a partridge in a pear tree! Although this colourful design by Sylvia Chalmers is missing its foliage! (Archive Reference: DC 068). 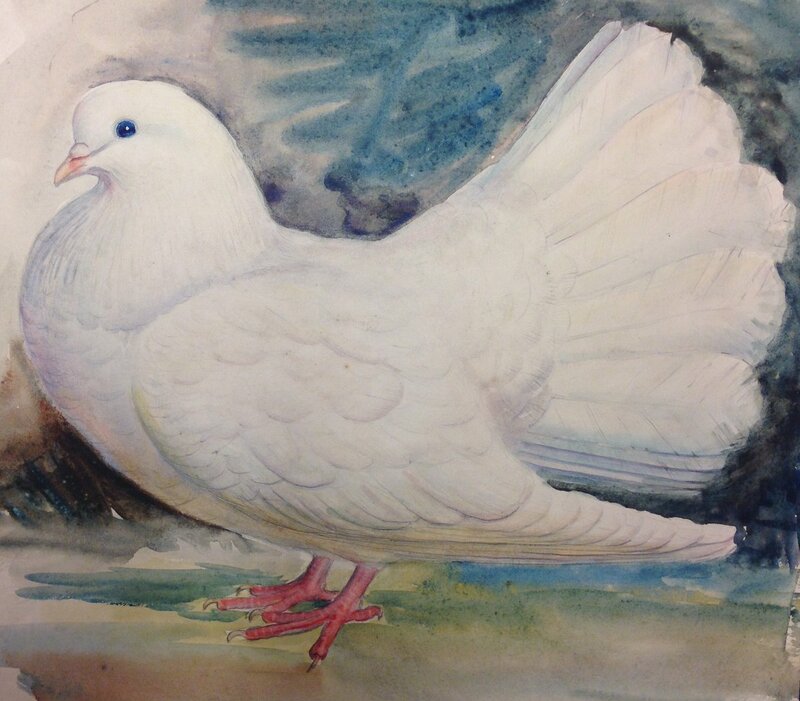 On the 2nd day of Christmas GSA Archives share with you…two turtle doves! Well, only one actually! A beautiful watercolour by a former GSA student, Gerard Murphy, who was at the school in the 1930s. This collection is soon to be catalogued as DC/084, so watch this space! 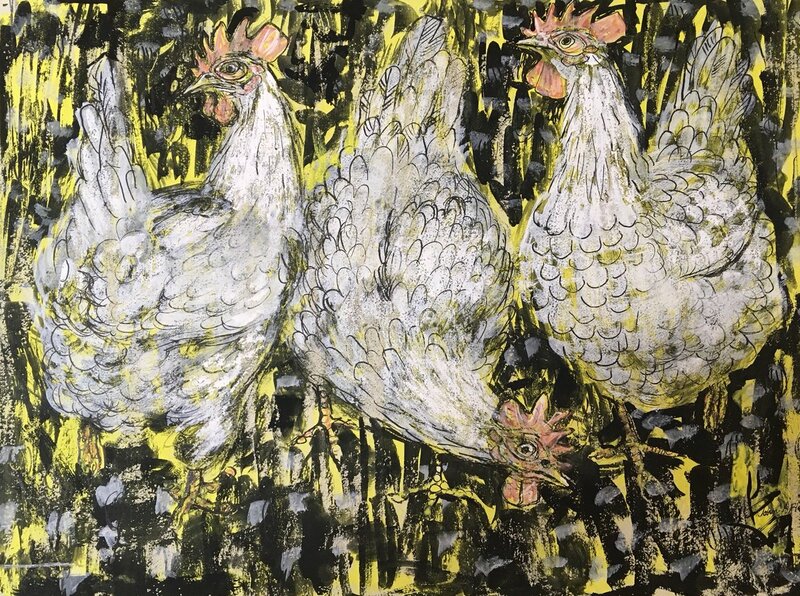 On the 3rd day of Christmas GSA Archives share with you…three french hens! French for the purposes of this exercise you understand…this ink and watercolour drawing from 1954 is called “Three Graces” by John B Fleming (Archive Reference: NMC 133). On the 4th day of Christmas GSA Archives share with you… four calling birds! Or as some people say, four “colly” birds… Google it! 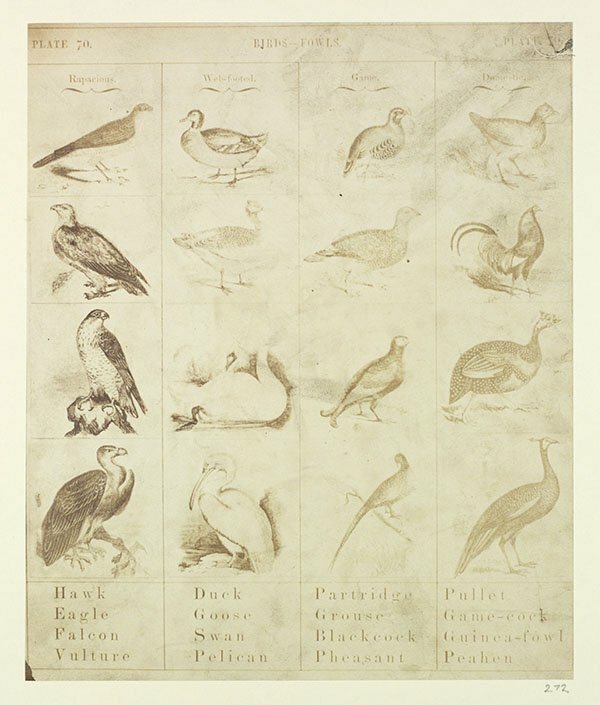 Here’s a “Chart of Bird-fowls” from our Duncan Brown collection featuring an array of feathered and flying creatures (Archive Reference: DB/272). On the 5th day of Christmas GSA Archives share with you…5 GO-OLD RINNNGGS! 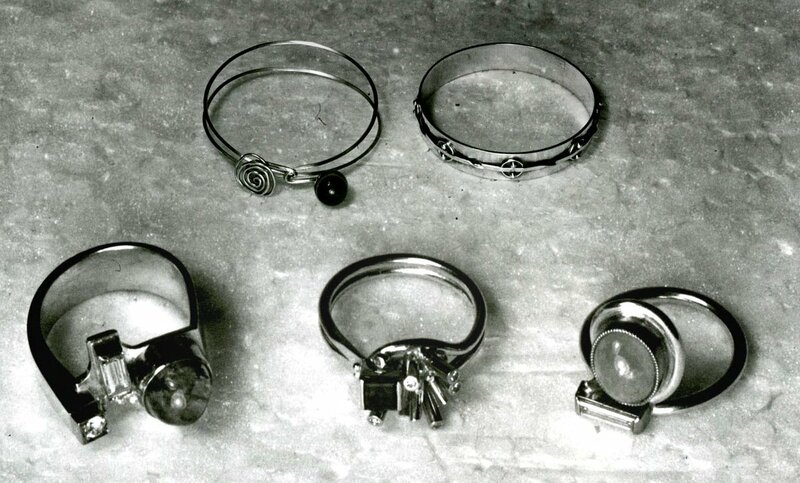 Well, we’re not sure if they’re silver or gold rings in this photo of some lovely Silversmithing and Jewellery student work c1980 (Archive Reference: P/1/1724 & 1727). 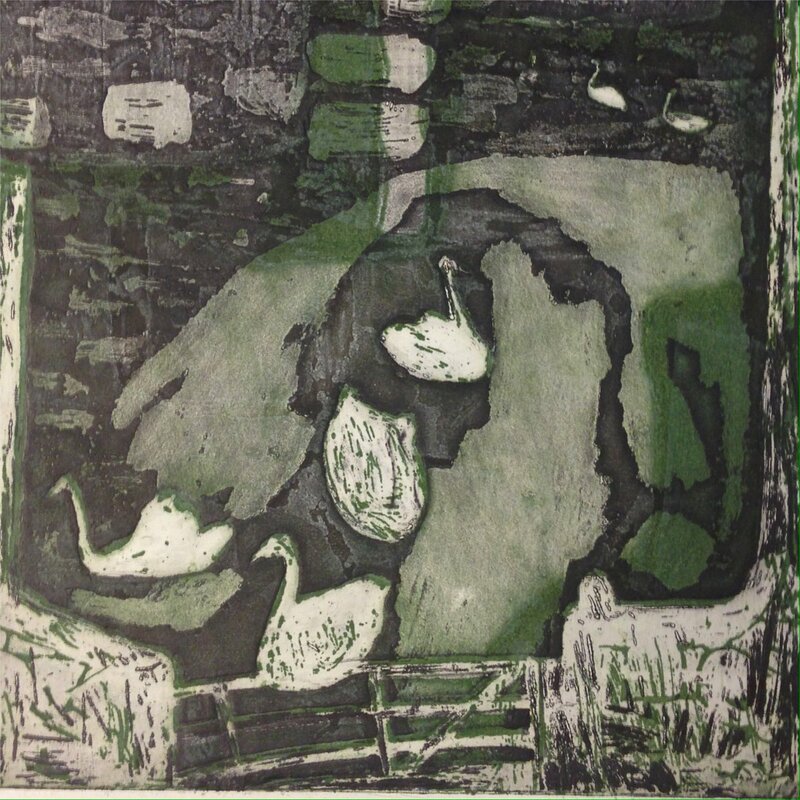 On the 6th day of Christmas GSA Archives share with you…6 geese a laying! 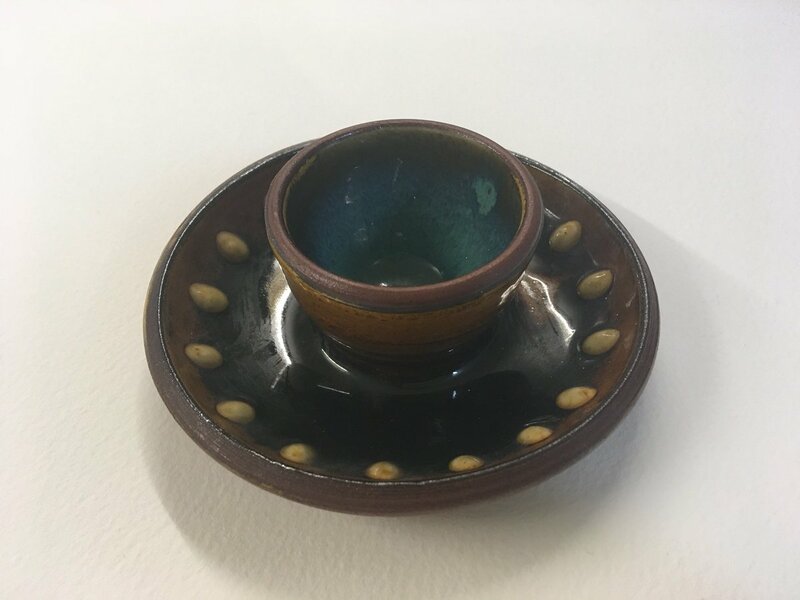 We’re not sure that a goose egg would fit in this ceramic egg cup by Robert Sinclair Thomson but it’s worth a shot! (Archive Reference: NMC/1387). On the 7th day of Christmas GSA Archives share with you … seven swans a swimming! With this beautiful print by Philip Reeves of ‘Swans on the canal’ (Archive Reference: NMC/816). 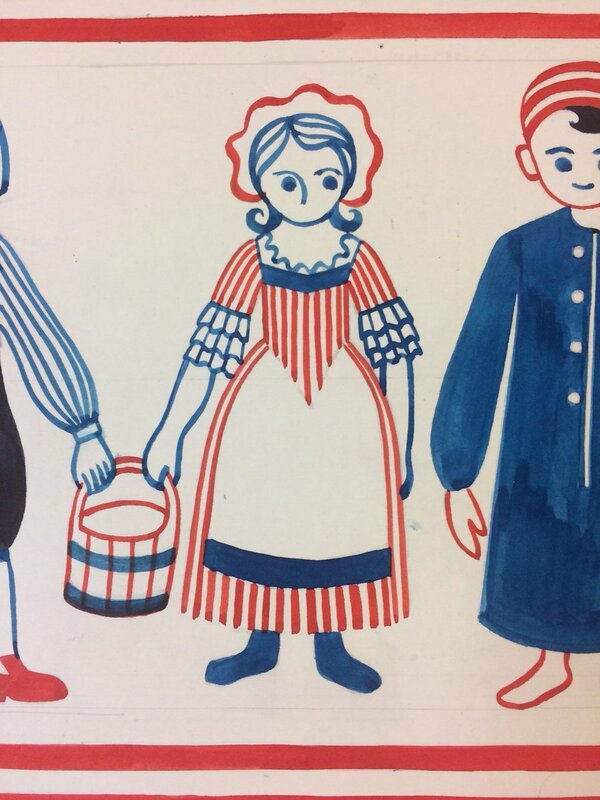 On the 8th day of Christmas GSA Archives share with you…eight maids-a-milking! A beautiful textile design sample from the Scottish designer and GSA alumna Sylvia Chalmers, who was a student at the Glasgow School of Art in the late 1940s. See Archive Reference: DC/068 for more designs. 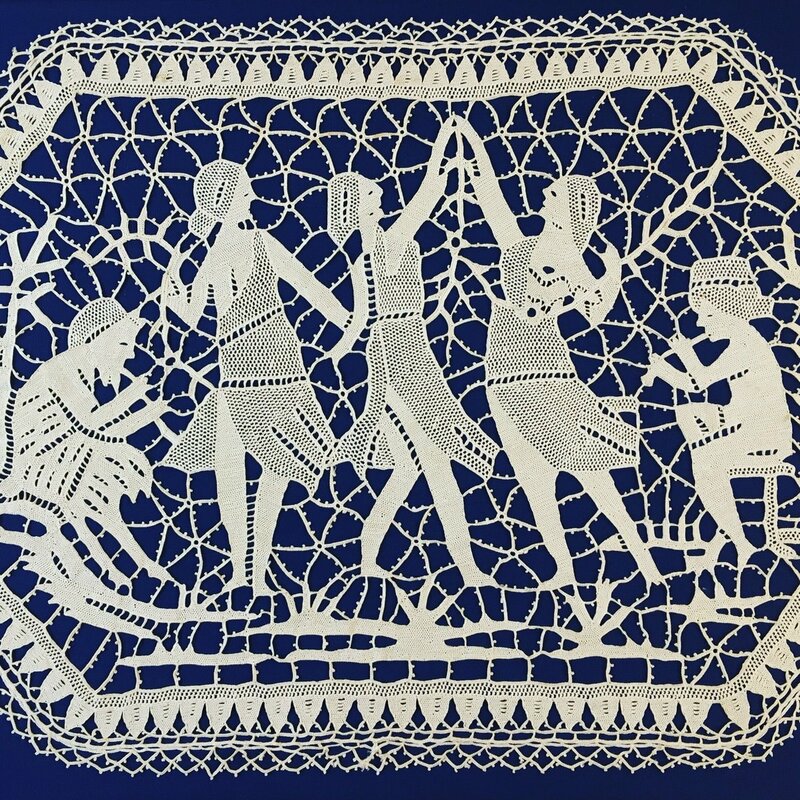 On the 9th day of Christmas GSA Archives share with you…(3 x 3 =) 9 ladies dancing! This Mat in “Venetian” lace features a design of figures dancing to Pan’s pipes, c1920s-1930s (Archive Reference: NDS/F/10). On the 10th day of Christmas GSA Archives share with you… ten lords a leaping! 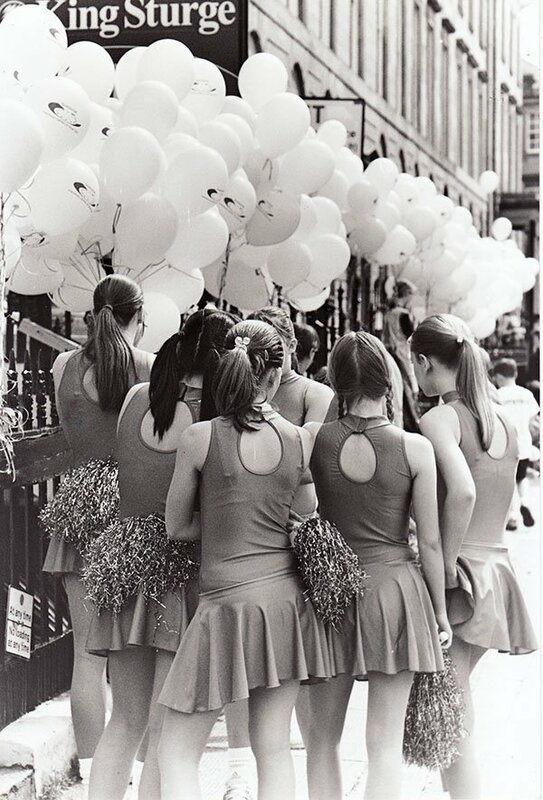 Well here are some ladies who look like they’re ABOUT to leap in a great image from our Robert Trotter photography collection called “Before the Lord Provost’s Parade” (Archive Reference: DC 042/1/196). 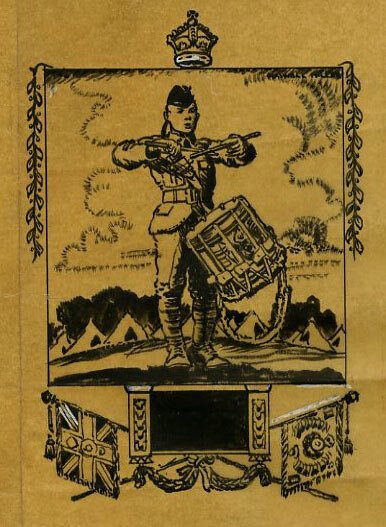 On the 11th day of Christmas GSA Archives share with you…11 Pipers Piping! 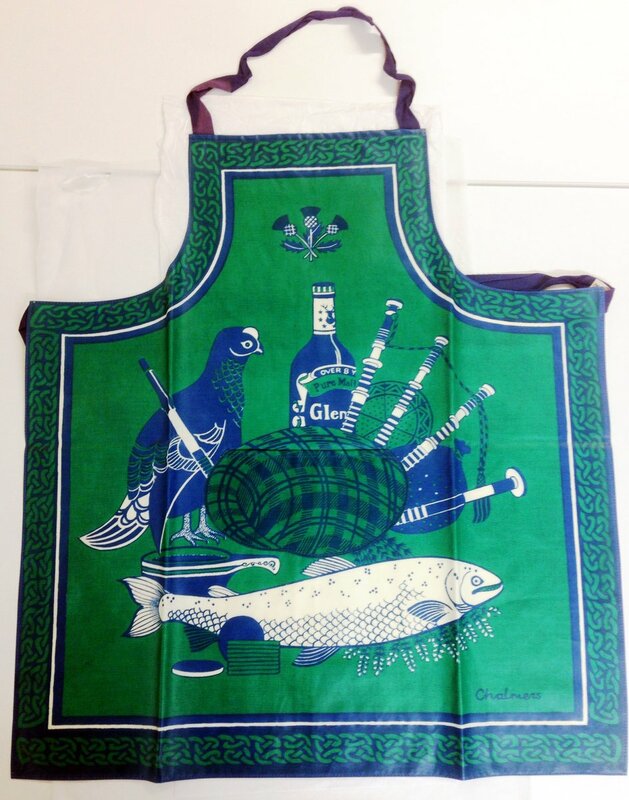 Here’s a set of pipes for the job from a very Scottish apron designed by textiles GSA alumna Sylvia Chalmers! (Archive Reference: DC 068/7/1/7). On the 12th (and final!) day of Christmas GSA Archives share with you…12 drummers drumming! This ink drawing is a design for The Scots Pictorial newspaper (Archive Reference: NMC 1325B). GSA Archives and Collections wish you a Merry Christmas and a Happy New Year! Cover image is Lace Mats, Late 19th-early 20th century (Archive Reference: EWTC/4).